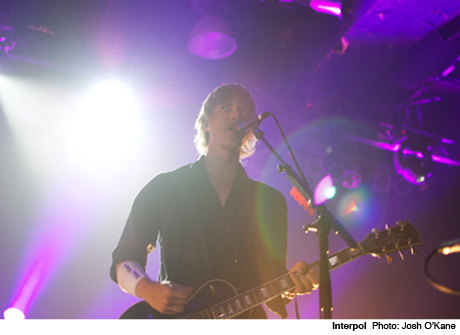 Following the release of their divisive self-titled record last month, NYC post-punk indie rockers Interpol have revealed a doozy of a tour. Though they have left the major label game and returned to Matador Records, the group have prepared a comprehensive trek befitting world famous rock stars. The run of shows kicked off earlier this month, including dates in the eastern United States before the band head to foreign waters. They will spend the rest of the year touring throughout Europe and Australia. Then, at the end of January, Interpol will return to North America for some shows across the continent, including Canadian stops in Vancouver, Toronto and Montreal. Then, for kicks, they'll head back to Europe in March. If you're impressed by that amount of planning, get this: the band have also revealed some tour dates for July 2011, when the group will be supporting monstrous stadium rockers U2. There are still gaps to be filled in, but confirmed Canadian appearances include Montreal's Hippodrome on July 8 and 9, and Toronto's Rogers Centre on July 11.